The Atlanta BeltLine encompasses 22 miles of old railroad corridor and seven miles of bike path, foliage, historical landmarks, and, this past Spring, was an area for students to express themselves and earn an A in class. Just under 15 years ago, this greenway was only a master’s thesis idea in a Georgia Tech graduate student’s head. Now it connects 45 neighborhoods within Atlanta in a loop around the city and provides a green space for not only its residents, but for the entire metro-Atlanta area. “It started out with connecting the city through trails and transit and since then has grown into a program involving green space and affordable housing,” Knox said. The BeltLine has continued to make improvements since its first trail opened in 2008, and that’s where Georgia State professor of art Pamela Longobardi and students from her installation and collaboration class came in. 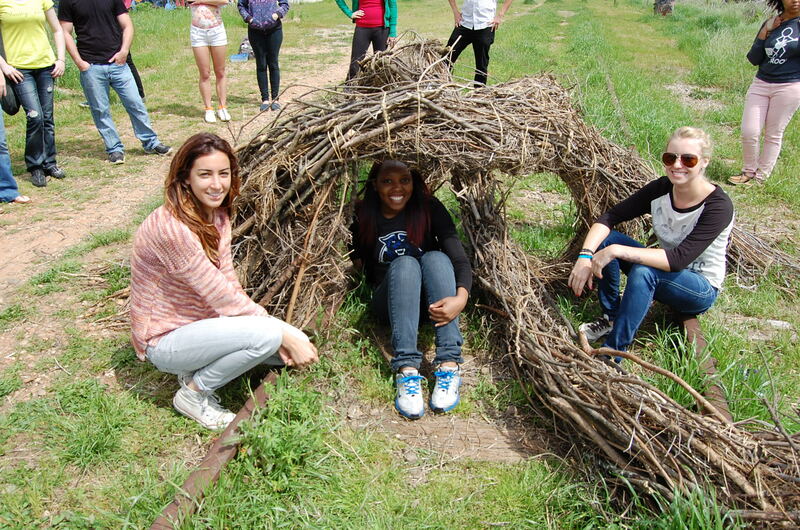 Longobardi worked on an installation art piece previously with the BeltLine, and she used her connections to give the same opportunity and experience to her students. For the class’s final project, students were expected to create and propose an art project idea to the BeltLine. Their projects were then on display in different areas of the BeltLine for a few weeks. “We wanted to use a type of material that was foreign to the environment but went with the flow of nature and mimicked nature,” Viveka Granata, who created the art piece, dubbed “Steelight” with Ali Kiely, her project partner, said. Longobardi and the art coordinator for the BeltLine, Élan Buchen, worked together to allow students to put their art pieces on the BeltLine earlier this year. Longobardi thought that the experience of being able to make and submit a proposal, as well as having to go through the approval and construction processes, would be extremely beneficial to her students. Student artists Granata and Kiely created an approximately seven-foot-tall work of art that was made of mostly reflective ribbon and steel rays that don’t seem to fit in with the otherwise natural feel of the trail. This was especially true for the installation and collaboration class because they all incorporated the natural surroundings of the trail in their works. In one case, a mud and grass head emerged from the ground and appeared to be swallowing part of an old railway track. Another piece was what looks like a dream catcher made entirely out of branches. Senior BSA student Sydney Daniel also had the opportunity to get some real-world experience while in Longobardi’s art class this past spring. Wanting to do something community based, Daniel and two other girls used different Atlanta neighborhoods as inspiration to create an arena-like structure made of chicken wire, colorful yarn and bottle caps from different Atlanta companies, such as Coca-Cola and SweetWater. What made the BeltLine-Georgia State collaboration special to Daniel was that it was out in the open with an unlimited audience. “You don’t have to go to an art show to see it, you could just be walking your dog and come upon it,” she said. So what’s on the horizon for the BeltLine? “We’re trying to bring people out to this public space and create a space for community engagement and dialogue,” Knox said. Getting the community involved is necessary to make anything the BeltLine does a success, which is just one of the many incentives they receive from allowing Georgia State students to display their artwork on the trails. With community involvement like Georgia State’s, the BeltLine can continue to transform the Atlanta neighborhoods it reaches.